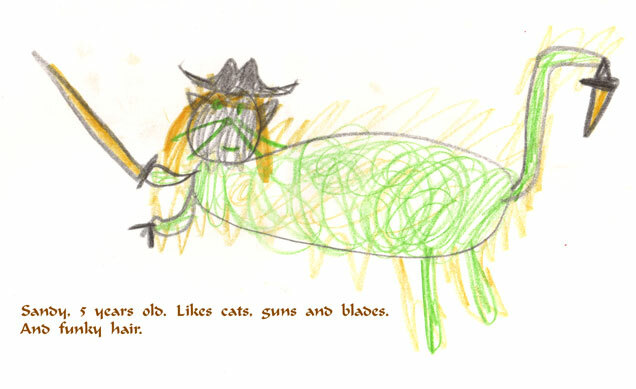 I might present you with an interesting picture I drew when I was in kindergarten... you could already see I was a rather strange little kid. I've recently begun to actually use my livejournal blog, so if you want to know some up-to-date stuff, check out Linguist's Lair. Well, the cats... The most dignified creatures on Earth. As long as they don't yawn, make faces, or fall off the window sill. I've got nine of them. My first cat, unfortunately, died in 1999. He was only ten years old. I hate to mention it, but since my mother has been basically unemployed (Well, minimum wage? Forget it. Maybe HALF) for several years, and my father's retirement pay is just enough to pay for our mortgage, I would ask for anyone looking at my cats' photos and stories to consider donating a few pence or cents via PayPal for cat food. Don't tell me it's our fault if we have so many cats-they're ALL strays we have taken in, and cat shelters around here are more than full. If you like one of them in particular, I'll assure you the food will go to him or her! I only have a basic PayPal account, though, so I'm afraid no credit cards...The address would be tansy (at) gmx.net.